Can room owners see their deleted rooms? Basically I just want to ask whether a room owner can see deleted room, transcript, messages in that room. I searched a bit and found this answer which says that a deleted room should be visible to "moderators, room owners, and users with at least 10k network reputation". But when I look at the room info, the user in question is listed there as the only room owner. No, room ownership does not allow one to see the room after it was deleted. Source: I am an owner of this deleted room and I get only an error message trying to access it. Only users having >= 10k reputation and moderators can see the deleted rooms. I recommend to visit Is there a list of SE chat privileges, and the minimum reputation required for those privileges? 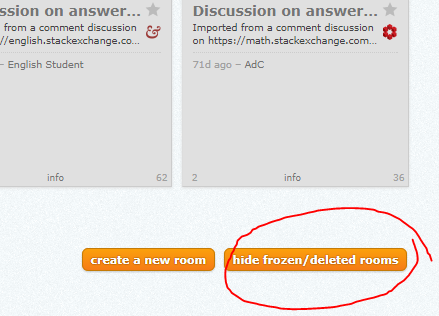 view frozen and deleted rooms (read access only if allowed). Room owners aren't privileged to list deleted rooms. Modetators can see deleted rooms and delete/undelete rooms. Note that Chat related privileges are not site specific. Not the answer you're looking for? Browse other questions tagged support chat room-owner deleted-room . Is there a list of SE chat privileges, and the minimum reputation required for those privileges? Is chat room transcript link permanent? 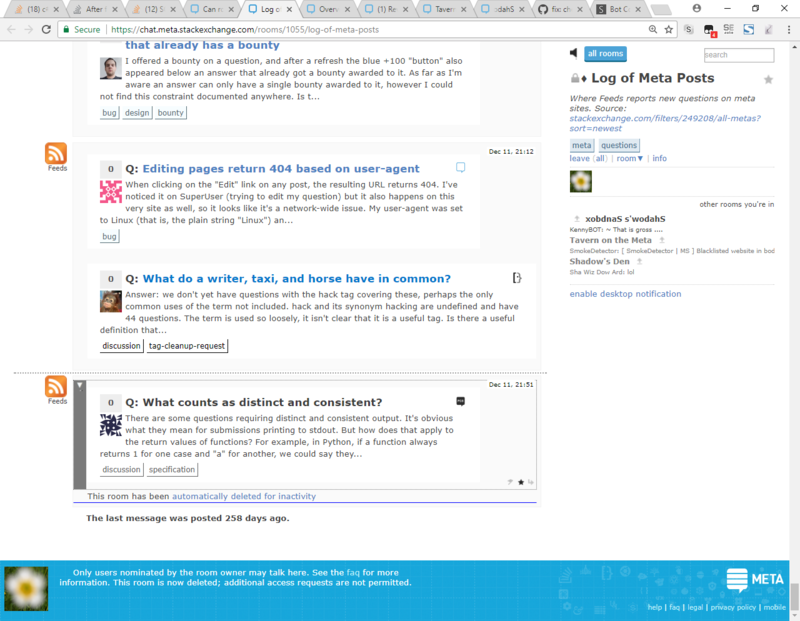 How can we allow moderators to delegate some chat-room maintenance?